The Hunting Act, which saw hunting with dogs banned, had a number of consequences. 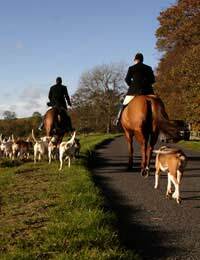 As well as changing the lifestyles of many people who had previously participated in fox hunts, it also led to the development of new ‘hunt monitoring’ organisations. These groups observe hunts and other events, in order to make sure that the participants are acting within the law. We spoke to a Surrey-based hunt monitor, who wished to remain anonymous, about his experiences. Tell us about hunt monitoring. What does it involve? Hunt monitoring is all about making sure that people stick to the law. Basically, we go out whenever a hunt or a similar activity is planned, and we watch what goes on. The idea is that the people taking part will be less inclined to break the law if they know they are being watched. And if they do break the law, we are there to collect evidence. The vast majority of hunts have stopped since the ban. But plenty of people still do drag hunting, which is fine, but we want to make sure that they are sticking to the law. In my youth I was quite heavily involved in politics. I went on lots of demonstrations and protests, and I started to meet people from the hunt saboteur movement. I never got into that side of things – I think at the time I was too scared and I didn’t really understand what it involved. Plus, even though I think fox hunting is disgusting, I was in two minds about trying to stop people doing something that was legal. But immediately after the ban came in, it became clear that some hunts were going to keep going anyway, regardless of the law. So at that point I joined a small group of people near where I live, and we started going out most weekends. What changed once the Hunting Act came into force? Obviously the number of hunts has gone down gradually. To begin with there were hunts over the country that went out despite the ban, I suppose in a sort of show of defiance. But in the beginning the police were basically doing our job for us – they were out monitoring and making sure the law was upheld. Now, though, the police have gone and it’s pretty much up to us. Sometimes it can be scary, particularly when people try and intimidate you. We get accused of stalking all the time. What will happen if the Act is repealed? Cameron has said there will be a free vote, but it doesn’t seem to me like that’s going to happen any time soon. If it does, I would be seriously worried that the Act might be repealed. If that was the case, lots of the monitors would presumably go back to being saboteurs. I honestly don’t know what I would do. I obviously think that fox hunting is wrong, I think it’s disgusting. But at the same time, monitoring is all about making sure that people stick to the law. And if the law changes, I’m not sure there would be much that I could do.